Incorporating in Nevada is the first tool an entrepreneur should implement. Nevada is becoming the leading state in protecting personal assets of entrepreneurs. With lawsuits growing rapidly in America, entrepreneurs need a legal way to protect their stuff. And Nevada is providing such a service with their corporation laws. The corporate veil is a legal concept that separates the limited partners (shareholders) of being personally liable for business activities. It protects shareholders personal assets (house, car, personal bank accounts, etc.). However, the corporate veil is not ironclad. When a judgment is entered and there are not enough business assets, the plaintiff may go after the shareholder personally, if the court allows. This is called piercing the corporate veil. There are three MUSTS to protect the corporate veil. Following State Corporate Formality laws. Such as keeping recorded minutes and resolutions. Have proper capitalization. This is the amount used for start up. Have a Business Account. Keep business accounts separate from personal accounts. Do not use corporate money to pay for personal expenses. In the last 30 years, the corporate veil has been pierced twice in Nevada. Compared to California, the corporate veil is pierced in one out of two cases. Nevada defends the corporate veil from creditors by implementing laws and policies that require less formalities and capitalization. Illustrated in the following 14 reasons. In 44 states, officers and Board of Directors are managing partners, meaning they can be held personally liable for the activities of the corporation. In 1987, Nevada passed a law to eliminate the personal liability of officers and directors. Under this law officers and directors are treated like shareholders (Limited Partners). So this law allows officers and directors of a corporation in Nevada to be protected under the corporate veil. Five other states such as Delaware have similar protection but they are not as thorough and comprehensive. Nevada is the only state that has passed a law that protects both the officers and directors. Most states only protect the board of directors through an article provision submitted at the date of incorporation. If an out-of-state customer sues your one-person corporation, you are considered personally liable. But because your corporation is in Nevada, the case will be brought in front of a Nevada court and it will be dismissed because the state of Nevada does not recognize you as personally personal liable. 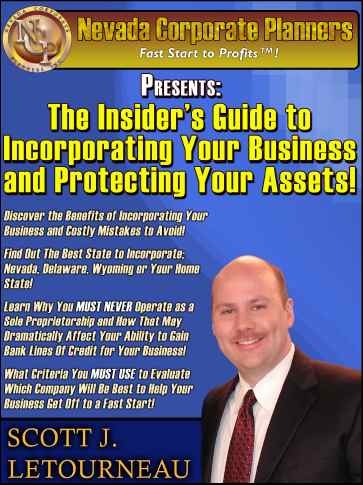 Read the following free resource, “The Insider’s Guide to Incorporating Your Business and Protecting Your Assets!” for more details on this benefit. Officers are automatically protected against legal responsibility of their actions whether it is stated in the articles of incorporation or not. This took affect in Nevada on June 15, 2001. Boards of Directors are protected from shareholder lawsuits. Shareholders must prove gross negligence on behalf of the Board of Directors. Proof is required to pierce the corporate veil under Nevada law. Under Nevada law the court must assign a percentage of faults to each defendant from zero to one hundred, with one hundred being the total. Therefore, corporations in Nevada will not assume equal liability for the amount of judgment entered against several defendants. Nevada does not require members of a corporation to be listed in State Records. Tax Information will remain confidential in Nevada. 48 states, Washington, D.C., Guam and American Samoa have entered into “agreements of cooperation” with “the IRS on the exchange of information on taxpayers” according to the CCH Standard Federal Tax Reporter, vol. 15 (2002), 36,894.576 at 64,490333. The remaining states Nevada and Texas have not entered this agreement. Nevada will only provide such information to the IRS during a legitimate criminal investigation according to the update of Assembly Bill 25. Some states require a certain monetary value of start-up capital. Each state has a guideline to determine “if you capitalized the corporation with enough assets to be considered a legitimate business.” If your business does not meet this guide line then, your corporation is considered “Thinly Capitalized” therefore it is believed you are operating the business as a hobby; granting creditors access to pierce the corporate veil. To solve this problem for entrepreneurs Nevada has allowed a capitalization amount of $200. Personal Assets can be held in a Nevada LLC as long as no business is performed through that LLC. Therefore one can hold personal real estate or other assets. Other states require a “legal purpose” which is defined their own way. Therefore your business purpose has to meet one of the states requisites in order to incorporate in that state. One person can hold the offices of President, Secretary, Treasure and sole director. Therefore you don’t have to bring other people into your corporation. Save money by submitting list of officer changes on the yearly renewal date. Some states require changes of officers to be submitted immediately with the secretary of state. This can become a costly expense. Nevada does not require stockholders, directors and officers to be United States Citizens or live or hold meetings in Nevada. Stock can be issued for services, personal property, real estate or capital. Directors determine the value of these transactions. There is no state corporate income tax or franchise tax for companies that have employees in Nevada. Nevada’s incorporation fee is priced in the middle of the pack, compared to the 50 states. To protect your "Financial Fortress” it is extremely low. Above are the 15 reasons why Nevada corporations are becoming the choice for new entrepreneurs. The odds of being sued as an entrepreneur are increasing daily. Studies have shown the average number of lawsuits for an entrepreneur is five. And of the five one of them is considered devastating personally. Entrepreneurs are taken action and relocating their business to Nevada on paper and registering their business as a foreign business in the state they reside. It will cost a little more money to set-up your business this way, but it is only a fraction of the cost of what you could loose in the future. Think of it as cheap insurance. To start building your financial fortress today, take the following six action steps. Start A Nevada Corporation - Set up the Nevada Corporation to act as a management company over your home state corporation. Go to Nevada's Secretary of State website and review the requirements for starting a business in Nevada. Set-up a Home State Corporation - if the company will operate outside of Nevada. Set-up a Living Trust - Place home, company stock, and personal property into a living trust to avoid probate and reduce estate taxes. Set-up a Limited Liability Company (LLC) - for rental property. This will provide asset protection and the ability to shift income to other family members. The Nevada Corporation will act as the management company. Set-up a Family Limited Partnership - for the stock from the Nevada Corporation. Set-up a Retirement Plan - under the Nevada Corporation for your family. Add units from the pension plan into the living trust. Set-up a retirement plan in the home state for your employees. Click here to order a free DVD on the process of building your "Financial Fortress".